Servings: 8 side dish sized servings. Modifications: Used 4 slices of bacon instead of 3. A bit more garlic, and a bit more red pepper flakes – 2 very large pinches. Notes: We made this before, more than 10 years ago, back when we use to get a CSA and got collard greens a few times. That was right when I first started actually cooking, so I think this version was quite a bit better. I did make sure I had enough collard greens this time (I got 3 bunches). I think you could cut back on the amount of broth – the liquid didn’t cook down as much, 2 cups seem like it would be enough. The flavor was good this time around – not too mushy, but greens were still tender, they had a good kick to them and weren’t too salty. 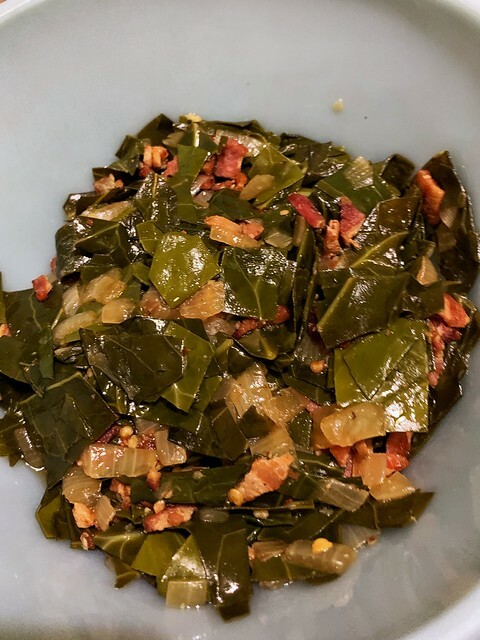 This entry was posted in bacon, collard greens, garlic, onion. Bookmark the permalink.